Strong indication has been provided by International Olympic Committee (IOC) President Thomas Bach today of his willingness to reform the Olympic sports programme as a key dimension of the Olympic Agenda 2020 modernisation drive. At last month's Olympic Summit in Lausanne, a key step on the road to the IOC Session in Monte Carlo on December 8 and 9 in which final Agenda 2020 decisions will be made, "an event-based rather than a sport-based" approach to the programme was agreed upon. This would involve trimming the number of events from existing sports in order to add new ones to the programme, so it would not increase the total number of athletes at the Olympic Games. 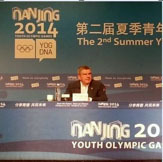 Speaking today shortly before the Opening Ceremony of the second Summer Youth Olympic Games here in Nanjing, Bach reiterated his support for this idea and expressed his hope that the IOC membership will think likewise. "We are discussing the procedure for the composition of the programme, because before we speak about sports and disciplines, we need to have flexibility," he said. "Now we do not have this flexibility because of the 28 sports. "As long as we have this it doesn't help to speculate on sports and disciplines, but the task and concentration is on changing this procedure. "Then, once we have have hopefully changed this in December, we can hopefully consider different sports or disciplines. "I guess and I hope it will not be restricted to one, and that there will be a good variety of sports that we can choose from at the time. "You have to go one step after the other, but I hope the IOC members will follow this recommendation in December to have more flexibility." In a reflection of the focus on youth and innovation, the Youth Olympics will feature exhibition events in wushu, roller skating, sport climbing and skateboarding, and it is thought skateboarding in particular has a strong chance of featuring at a future Olympic Games, possibly as soon as at Tokyo 2020. Bach said he was keen to see how all four disciplines can convey their passion to the youth, and that he was "really interested to see how this experiment works". Softball and baseball are other sports strongly hoping to be reconsidered, along with squash, after the sports unsuccessfully bid to return to the Olympic programme during the IOC Session in Buenos Aires last September, where instead wrestling was returned after its removal earlier in 2013. Another subject which is under discussion as part of Olympic Agenda 2020 is the Youth Olympics itself and, after hefty praise for Nanjing 2014, Bach did imply that changes could be made. "We are now 100 per cent concentrated on making the Youth Olympics an outstanding success," he said. "Then after this, we will see what is lined up and we will see what could be done better. "Nothing in this world is so good that it cannot be tampered with, but this discussion will start only after a successful Youth Olympic Games here in Nanjing."